The SV1: MORE POWER, INCREDIBLE DRIVEABILITY, INCREASED FUEL MILEAGE! The SV1: OUTPOWERS EVERY 4150 CARBURETOR WE HAVE TESTED. Chris Hile: We installed an SV1 on our Big Block Modified and the 4150 did not stand a chance. The SV1 blew it away!! Edge Racing Engines – We used an SV1 on alcohol to build a Late Model engine that eclipsed the 1000 h.p. barrier. Scoring a dyno proven pull at 1016 h.p.!! Yeoman Racing Engines: “All our high powered Late Model engines show a minimum 12-15 h.p. gain. Everytime”. If you are a high powered circle track or road racer it’s time to look at where its all going. The SV1. It’s not rocket science…its just the best way to layout and build a high powered carbureted program. The American Built/Designed and Manufactured SV1 offers incredible throttle response, clean and crisp idle characteristics, smooth throttle control, increased power/torque, increased fuel mileage and HUGE 1100-1260 cfm capabilities on a 4150 bolt pattern intake manifold (1180 cfm and up versions require our Mach 1 Series 7/8″ tall spacer for blade clearance..see our Racing Parts section). These are numbers and capabilities that a 4150 series carb has no chance of competing against in the high horsepower world of racing. Sure the SV1 is big in cfm, BUT due to the superior atomization of the SV1, it also offers improved fuel mileage over four barrel carburetors too. As a result, the SV1 makes its best power at typically .5 of an air to fuel ratio leaner than four barrel carburetor designs. MORE power with LESS fuel consumed!! Best of all if you have a 4150 intake manifold the 1100 REAL cfm SV1 bolts right on… no adapters required!! It has the same overall length as a 4500 Dominator series carb with the same 7-5/16″ air cleaner flange. It ALSO offers increased hood clearance as it’s shorter than a 4150!! 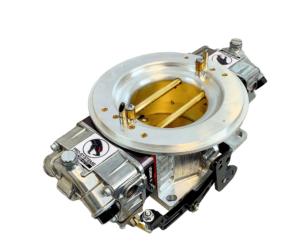 Also with the SV1’s high signal level, you can run a much larger carburetor than you are used to with the SV1 (consult a rep for cfm requirements). The Patent Pending SV1 is changing everything in the world of racing. In back to back dyno testing on several 700-900 horsepower engines the SV1 picked up a minimum of 10 horsepower over the best 4150 series carburetors we could get our hands on. Average gains were in the 20-30 h.p. range!! Some of these 4150 carbs were priced at over $1600.00! The SV1 also used on average 15 lbs/hr LESS fuel to achieve these higher power levels (thats 2.5 less gallons of fuel consumed during a one hour event). PLUS: No special jets or gaskets required. It uses standard 4150 holley jets and gaskets! So if you are looking for the last bit of power and mileage out of your program to get past the competition….the SV1 is it! Fill out an online quote form today, for a quote on an SV1 for your Circle track program. You’ll be glad you did! !